Now that GET IN, our new Youth Promoter project, is underway we will be getting to know each of the Youth Promoters involved, in a series of Youth Promoter’s Voice articles. This month, Chloe from the Seaboard Centre, Balintore tells us why she got involved in the project and what she hopes to get out of GET IN. I started work at The Seaboard Memorial Hall in Balintore in January this year, as a Graduate, to encourage community learning and development. Brought up in Tain, its a nice job to find as it is not often you’ll find a graduate placement so close to home! The Seaboard Memorial Hall have recently joined the Touring Network as we are very keen on bringing more music and arts to the community. When I’m not at work I am playing music! I play the fiddle and I gig often with my partner Nicky Murray. I have just started up a weekly music session called ‘Seaboard Sessions’ and so far that has been successful. I stumbled across the GET IN page on the Touring Network website at work whilst I was searching online for funding opportunities for promoters. I was attracted instantly to the opportunity, as where better to find the training required to become a promoter (particularly in rural areas) and to be able to network with other promoters/performers than the Touring Network. The knowledge and experience that I will gain from organising a tour with other young people will help both myself and the Seaboard Memorial Hall progress, and I can’t wait to see it all unfold! I have had some experience in booking gigs, promoting my own gigs and contacting venues – but mostly from a musician’s viewpoint. I am keen to learn skills – from a promoter’s side of things – such as managing budgets, marketing and liaising with performers, managers and venues. Knowledge of the industry is really essential and I hope to get to know the dance and theatre scene better in Scotland. I think GET IN will help me do this as we have a keen group of young promoters with various different skill sets and experiences – from volunteering to music, to theatre to dance, etc. It’s great to hear your enthusiasm for the project. What’s been happening so far? So far we have met up in beautiful locations such as Ardfern, the Isle of Coll and Strathpeffer – another bonus of the GET IN project. It is great to see other village halls and venues around Scotland and get new ideas to bring to the Seaboard Hall. The most recent training day I attended was at the Strathpeffer Pavilion and was all about Budget Management and Fundraising. Rhiannon (The Touring Network’s Services Manager) gave us a presentation on budget management, which will definitely come in handy when we are organising the tour. Jo (The Touring Network’s CEO) then told us about various types of fundraising out there, and advice when filling out applications. Yvonne Potter, who works at the Strathpeffer Pavilion, shared her expertise in putting on events, how to cost an event, and where they find their funding. Finally we had a natter with Pip Utton, who was performing his show Maggie at the Pavilion that night. He is very admirably passionate about theatre! It was mentioned that theatre audiences are in decline and we were discussing why and how to overcome this. Someone said that theatre was very insular and that the change in our world right now is huge (particularly in technology) and theatre needs to keep up. Since the last training we have had further discussions regarding mentors and ideas of who we are going to tour. We do this using Slack – a great communication app. Our next training session is in Edinburgh in August. 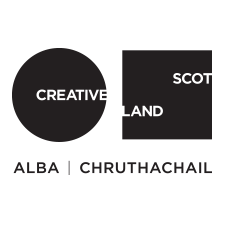 I am looking forward to going to Loopallu – a small music festival in Ullapool – as part of the Go See fund, and I hope to chat to the people involved in the organisation of the festival and the performers too. It will be great to find out what goes into organising a festival and hopefully I will get some inspiration for the GET IN tour. I hope to go and see some theatre and dance for future Go See trips, as I have not experienced much of this. As I have little knowledge on what theatre/dance shows will be worthwhile going to I will seek some much needed advice from other GET IN participants on what shows they would recommend. I also look forward to finding out who my mentor will be and what expertise they can share with me. What a great opportunity! I can’t wait to get into the swing of organising the tour. You learn the most when actually putting on your own events, so putting on a tour across Scotland will be some experience for all of us! Communicating with each other may be challenging as we all live in different areas of Scotland so it’s not always easy for everyone to attend every training session. But we’ve no excuse nowadays as we can all do this online! Thanks for taking the time to answer our questions Chloe. We’re looking forward to seeing you progress as a GET IN Youth Promoter!